Is Chick-fil-A Christian If They’re Doing This? How often I have wanted to gather your children together as a hen protects her chicks beneath her wings, but you wouldn't let me. Arguably the most well known company with a Christian ethos, Chick-fil-A proudly lists bible verses and Christian quotes in its mission statement and press releases. All of its over 2,000 restaurants are closed on Sundays to keep the Sabbath. With a revenue near $6 billion a year, it is one of America’s most successful food chains. There is no doubt that Chick-fil-A has successfully combined its Christian heritage with marketplace achievement. Delicious Chicken Sandwiches... But At What Cost? Jesus compared himself to that of a mother hen (Matthew 23:37). Today, chickens are the most abused and exploited species on the planet. In the United States, a staggering 9 billion chickens are killed each year for their meat. Almost all of these chickens are raised on massive factory farms covering thousands of acres. Hidden camera footage by undercover investigators inside these Chick-fil-A supplier farms have revealed sickening cruelty to animals. The chickens are bred to grow so large, so quickly, that many of them suffer crippling leg deformities. Because their breasts grow abnormally large while their skeletons and other organs lag behind, their legs often break under the weight of their own bodies. This is even worse than it sounds since chickens are fully conscious and contrary to their reputation, chickens are remarkably intelligent. Chickens at these factory farm suppliers don’t see the light of day or receive any exercise. Most have trouble breathing in the overcrowded, filthy conditions while many others suffer heart failure and chronic pain. To keep the chickens eating and growing as much as possible, their sleep is restricted by keeping the interior lights of the warehouses illuminated at almost all times. Because the floor is cramped with so many chickens, they fight with each other for space, making sleep even more difficult. Injuries and illness run rampant in these filthy conditions; the chickens live in their own waste. Many chickens die on the warehouse floor, their bodies rotting among the other chickens, adding to the overall stress and unhygienic conditions. Dr. Bernard Rollin of the Animal Sciences Department at Colorado State University, after reviewing the undercover footage from one of the supplier slaughterhouses, stated: "From the moment that the chickens are dumped from trucks to a conveyor belt in large groups--surely terrified--[and] then hung upside down by their feet, we can be morally certain that the animals are experiencing significant fear. Still hanging by their feet, the birds are [then] transported to an electrical bath, which is supposed to render them insensible, before they are cut up by a mechanical knife. It is evident from the video that many are still conscious when this occurs…conversation among workers on the video confirms that a significant number of birds are conscious even when they are immersed in the scalding tank." Is It Hypocritical to Call Themselves Christians? Does the image that Jesus describes of himself, a loving mother hen protecting her chicks beneath her wings, fit within the practices of these Chick-fil-A supplier factory farms and slaughterhouses? Animal cruelty is considered a sin by all credible Christian denominations, organizations, bible colleges/universities, leaders, and theologians. Why then is the blatant cruelty inflicted upon these innocent, sentient creatures allowed and paid for by Chick-fil-A? Let us ask ourselves honestly, what does Jesus think about the suffering and misery inflicted on these chickens, his creation, on these factory farms? Does he approve of us burning chicken’s beaks off so they don’t inflict injury upon each other due to the unimaginable stress and lack of space? Would he approve of us slitting their throats and placing many of them in a scalding hot chemical bath while fully conscious? Does God not give chickens 10 years to live? Yet these chickens only live a few weeks. Chick-fil-A vs. Chipotle: Who Wins? Yet Chipotle is widely known to the American public as an environmentally friendly restaurant chain that doesn’t source animals from factory farms. They have publicly stated their commitment to invest in strains of chickens that have been bred to increase the quality of life for the individual birds--not for quick, unnatural growth. Chipotle only purchases from farms that provide enough space for each individual chicken’s health and happiness. These spaces include proper natural lighting and bedding/floor enrichments that allow chickens to express natural behaviors. Chipotle does not waver from this policy. When many Chipotle restaurants run out of chicken or beef sourced from one of their farms, instead of purchasing meat from a factory farm until they can get another shipment, the manager puts up a sign saying that until the restaurant can replenish their supply from one of their humane suppliers, food items consisting of these meats will not be served. Moreover, all of Chipotle’s supplier farms are required to demonstrate compliance with humane standards via audits by Chipotle’s internal Animal Welfare team as well as third party auditors including the Humane Society of the United States and Compassion in World Farming. In addition to emphasis on animal welfare, all of Chipotle's food is GMO-free. If Chipotle, a company that does not publicly state they exist to glorify God, can produce “Food with Integrity”, how much more should a company who says they exist to glorify God​!? Chick-fil-A promotes itself as a God-fearing company whose most important aim is to glorify God. But it seems that they are falling short of this goal while Chipotle is much closer to obtaining it. James 2:26 says that faith without works is dead. Chick-fil-A proudly points to the fact that they are closed on Sunday’s as evidence of their commitment to biblical teachings. But in Matthew 12:11, Christ implies that we must help animals even on the Sabbath. Chick-fil-A follows the Sabbath but refuses to extend mercy to animals. They source their meat from factory farms. Is Chick-fil-A being a faithful steward to God by purchasing chickens that were treated like commodities instead of living beings? According to a senior executive in the Chick-fil-A marketing department, "There's just something naturally whimsical about a cow trying to protect its own life. It's funny stuff. "(2)Steve Robinson senior vice president of Chick-fil-A marketing. 1998 Readers’ Choice Awards February 27, 1998 Page 9c. How can anyone who knows of the heinous cruelty inherent to factory farms make such a callous and heartless statement, using one species to advocate the slaughter of another species, making light of billions of chickens and cows who endure such unfathomable suffering before being slaughtered? Can You Gain the Whole World and Still Lose Your Soul? Chick-fil-A brings in nearly $6 billion revenue a year. It could be said without overstatement it is one of America’s most successful companies. Founder Samuel Cathy’s net worth at the time of his death in 2014 was approximately $4 billion. Both his son’s net worths are in the billions and Forbes lists them as two of the 200 wealthiest people in America. But on what type of money is the Chick-fil-A fortune built upon? Are these riches, earned on the suffering and despair of innocent creatures, righteous in God’s eyes? When one reflects on these teachings and the way in which the Chick-fil-A financial empire has been built, a frightening question emerges--if our bank accounts are full but our souls are bankrupt, will we be welcomed into the kingdom of God? What type of legacy is Chick-fil-A building and leaving? Is it leaving a Christian legacy based on the biblical foundations of love, compassion, and righteousness? Or is it leaving a legacy of suffering and cruelty to animals? If we keep the Sabbath but inflict incalculable suffering on God’s innocent creatures, are our actions reflective of the Holy Spirit or humankind’s sinful, fallen nature? Jesus referred to himself as the Good Shepherd. A good shepherd loves, cares for, and protects his flock. If a chicken on a factory farm is screaming out in pain and suffering yet we do nothing to help her, are we being a good shepherd? If we say we are animal lovers, praying for the end of animal suffering, but proceed to pet our dog or cat with one hand and pay for the suffering and death of a factory farmed animal with the other, we are hypocrites. To look at it any other way is to deceive ourselves. When we buy animal products like this we are acting in a way that is contrary to being a good shepherd. Animals have no powerful corporate lobbyists or political advocates to stand up for them. When we allow the abuse and suffering of God’s defenseless creatures to go unchecked, we are treating God with contempt. Is a "Double Victory" Possible? We are all brothers and sisters in Christ. Not one of us is without sin. As the Christian community, we are to learn from one another and lovingly help each other to lead the most godly life possible. Chick-fil-A should be commended for giving Sundays off to all their employees. But to truly glorify God as their mission statement says, it needs to disavow the use of factory farmed chickens like Chipotle has. There is no way Jesus would condone the horrific conditions in these warehouses of misery if he were to see them. Martin Luther King Jr. talks about a "double victory" where not only do we win, but our opposition also wins. As Martin Luther King Jr. said, the goal is to "appeal to your heart and conscience that we will win you in the process, and our victory will be a double victory." Our goal is not to "defeat" Chick-fil-A. Our goal is to win the heart and conscience of Chick-fil-A. We care about getting a double victory. We want their minds and hearts to be changed by this and we want them to do the right thing. If Chick-fil-A truly wants to leave a legacy of love and righteousness, it needs to stop selling factory farmed meat. The first way is to set meaningful animal welfare policies. All of the major animal welfare organizations have come together and agreed upon the most pressing welfare concerns related to broiler (chicken) production and how to best mitigate those concerns. Chick-fil-A must sign on to these common-sense requirements. Anything less is to be downright ungodly. After all, if Chipotle can do it, how much more should a Christian organization like Chick-fil-A!? The second necessity is to offer one or more of the many plant-based chicken alternatives that are completely cruelty-free. These alternatives taste almost exactly like chicken and are much healthier for the human body. The taste is so similar that in countless taste tests--many of which have been shown on live television programs like Good Morning America and Today-- the consumers could not tell the difference between the real chicken and the plant-based chicken. We know that Jesus had the foresight to relate himself to a chicken. This is quite fitting since chickens as a whole are some of the most abused animals in the world. What Kind of a Legacy Will Chick-fil-A Leave? As the Christian community, we must strive to lead the life God intended when He created the Earth, the life described in Genesis in the Garden of Eden and prophesied about in the book of Isaiah. 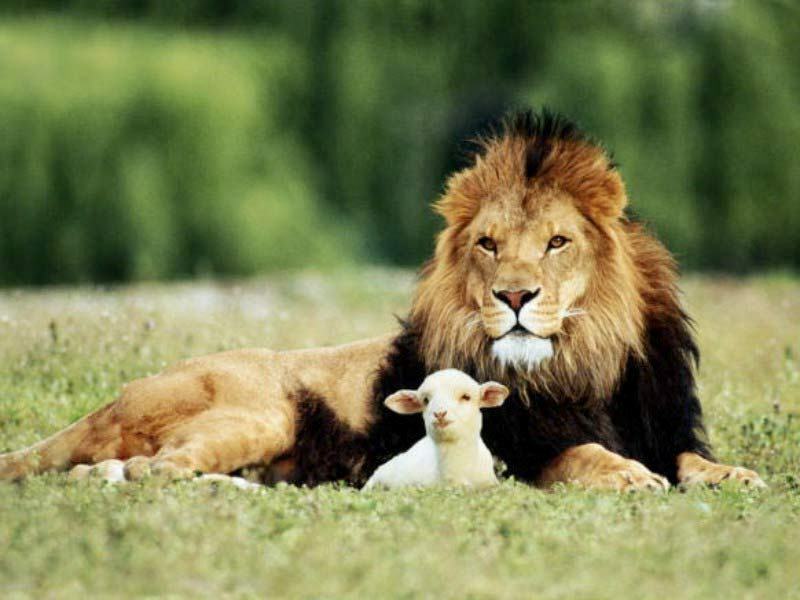 In His Messianic Kingdom, all God's creatures, not just humans, will live together in peace and harmony, without cruelty or death. How will Chick-fil-A be remembered? As a blessing to the world? Or as a curse to God's children? ​In that day the wolf and the lamb will live together. the leopard will lie down with the baby goat. and a little child will lead them all. The cow will graze near the bear. The cub and the calf will lie down together. The lion will eat hay like a cow. The baby will play safely near the hole of a cobra. Yes, a little child will put its hand in a nest of deadly snakes without harm. Why has Chick-fil-A not signed on yet? 2. ↑ Steve Robinson senior vice president of Chick-fil-A marketing. 1998 Readers’ Choice Awards February 27, 1998 Page 9c.